If your home or business has been damaged by a flood or leak, we will restore it with our comprehensive water damage restoration services. Whether you have water damage from firefighting, a basement flood, or a frozen pipe, we are experienced in every situation. Our 25 years of experience ensure that the job will be done thoroughly and correctly. Your home or business will be safe to occupy and will look as it did before the flood. We repair and replace all structures affected by water damage to ensure their integrity, quality, and finish. After we have extracted the remaining flood and removed all debris, we test the flooded rooms for moisture. Once the moisture levels are known, powerful air movers and dehumidifiers will be set up in each room with elevated moisture levels. These machines will be left in place for several days. We test the moisture continually until the home or business is completely dried out. Everything in the room will be temporarily removed during the process. The affected drywall, flooring and insulation will be replaced. Each wall, floor, and ceiling will be checked for mold. Anti-microbial spray will be applied to prevent future growth. It takes several days for a home to dry out after a flood or water leak and we never rush the process or leave before the job is done right. Once the structure is dry and all the damaged materials are removed, we will rebuild the flooring, drywall, baseboards, trim, and fixtures to their original pre-existing quality, including sanding and paint. Our customers rest assured knowing their home is taken care of by caring professionals experienced in all types of water damage repair. Our dedication to provide the best water damage clean up to our customers is clear in our process and evident in our craftsmanship. 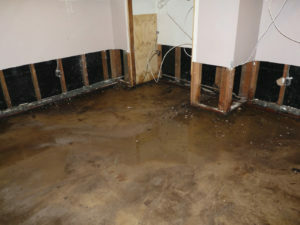 Call us now at (877) 645-1428 for comprehensive flood damage restoration services.